“Xi is a very great leader. He works not only in his office, but among the people,” said Keovichith Lamngeun, a Laotian who worked as one of the nine foreign linguists on the translation of the 19th CPC National Congress report. “From my observation, the general public likes Xi because he has brought about changes,” said Peggy Cantave Fuyet, who was responsible for the French version of the report. He queued and dined with members of the public in a roadside restaurant. He bought festival gifts himself before visiting old acquaintances in the village where he worked as an “educated youth.” He stood in heavy rain talking with frontline workers. He has walked into farmers’ barns and kitchens, checked the menu at nursing homes and stressed virtue to young students. He once visited Beijing’s hutongs in heavy smog, dropping in on residents to ask about their work, salaries, what they burned for cooking and heating, as well as how far their homes were from the nearest toilet. Xi has visited all of the poorest areas suffering “abject poverty” in China. At the 19th CPC National Congress, he was a delegate of southwest China’s Guizhou Province, one of the poorest regions in China, with per capita GDP of around 33,000 yuan (about 4,980 U.S. dollars), close to 20,000 yuan lower than the national average in 2016. Media reports of this discussion have drawn numerous clicks and many “thumbs-up” on the Internet. 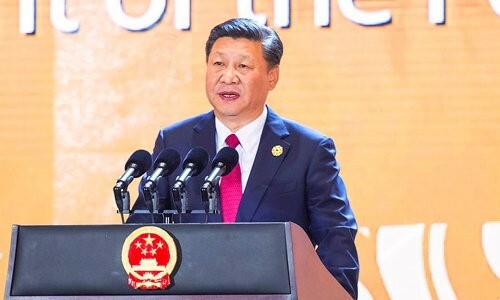 “The original aspiration and the mission of Chinese Communists is to seek happiness for the Chinese people and rejuvenation for the Chinese nation,” Xi told more than 2,300 delegates at the congress. In November 2013, during an inspection tour to the central province of Hunan, Xi visited Shibadong, a Miao minority village labeled “poor” at the time. “What should I call you?” asked illiterate villager Shi Pazhuan, as she welcomed Xi into her home. “I am a servant of the people,” Xi introduced himself. During that tour, Xi first put forward the concept of “targeted poverty alleviation,” which refers to measures that include a system to keep track of every household and individual in poverty to verify that their treatment is having the desired effect. For Shi, “targeted poverty alleviation” meant a government subsidy to finance a kiwi fruit plantation for her and her neighbors. He has pledged to lift the country’s remaining 40 million impoverished people out of their situation by 2020, a step against poverty unprecedented in human history. He presided over meetings of the Central Leading Group for Deepening Overall Reform to discuss major medical reforms and made “Healthy China” a national strategy. Xi is practicing the CPC principle of serving the people wholeheartedly. What makes him stand out may lie in his experiences of living and working as an “educated youth” — urban youth sent to remote rural areas to “learn from farmers” during the Cultural Revolution. He stayed in Liangjiahe, a small village in northwest China’s Shaanxi Province, from 1969 to 1975. He is well qualified to be confident about his comprehension of ordinary people’s life in this populous country. During his about 44 years in politics, he rose from grassroots Party chief to the CPC leader, from an ordinary citizen to the country’s president, from an average military officer to the Central Military Commission chairman. He leads the CPC in serving the people’s interests — usually long-term interests — with foresight and consideration for what can be carried through.